We made our way to the base of the strut; I was conscious of the possibility that the HoN Co. guards could be close by, but once I could see the stairs were clear, and there was sign of any talking, THEROS began to ascend. "Where do you think this will put us in terms of distance to the main structure? We can't be that far away if the larger portions are just over there..."
THEROS turned back to THEXIS and motioned with his finger to keep quiet. I remained motionless and silent for a moment, thinking that THEROS had heard voices again, but when he began moving further up straight away, he just wanted to ensure we didn't give our position away. Additionally if the HoN Co. guards were here and didn't know about us then we could retain an element of surprise. I felt a little vulnerable walking up the edge of the stairs, a steadily increasing height growing to my left; I told myself that everything would be okay provided I didn't look down. I don't have a fear of heights, not normally, but I'm pretty sure it's not the heights that scare people. I'm more scared of falling off! But I wasn't presented with an alternative when I had to manoeuvre myself along a small section that wound back on itself. Gulping slightly whilst looking at the dizzying vertical drop, I calmly breathed in and continued. When the small lip of the bridge was within my grasp, and I swung my legs over onto the main walkway, then I was able to breathe easy again. "Right, we approached from that direction, from where the lava lake was, so logically we should head in this direction where the larger structure should be..."
"Logically yes. 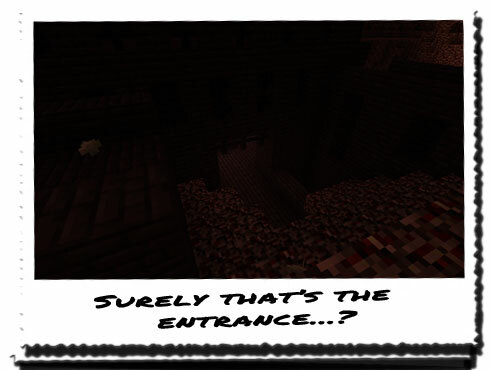 Also, the other three routes not only take us away from those, but they are also surrounded by Nether stone. If the last structure taught us anything, it's that that is the wrong direction to head in." "Oh... So it leads down to where we need to be...?" "I don't know, but look down there! A light source... That's either the lava basin or the torch trail left behind by the HoN Co. guards..."
"But the guards hadn't left a trail of torches before... So... It can only be one thing..."
"Do we just take it or..."
"We could do what we did before...? Take it and run... Worked last time..."
"Or, we could destroy the cages and then take it; stop them from having a chance to spawn..."
"No, that might actually cause them to spawn before we touch the Eye... We just..."
"Finally... We've been following you for some time... Come forward or we'll kill you where you stand... Now!"